Seven years ago today, the Castro dictatorship executed three men — Lorenzo Enrique Copello Castillo, Barbaro Leodan Sevilla Garcia and Jorge Luis Martinez Isaac — for their roles in the hijacking of the passenger ferry "Baragua." 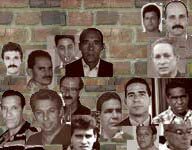 Their executions may not have been "justice" — the Inter-American Commission on Human Rights later determined Cuba had violated international agreements to which it was a signatory — but the regime did act swiftly in the case. The ferry was hijacked on April 2, 2003; the men were convicted on Tuesday, April 8, 2003, of "very grave acts of terrorism." and by Friday, they were dead. Occurring in the midst of the "black spring" crackdown on Cuban dissidents, the government dared not show weakness. Other men were tried and received lesser sentences for their supposed roles in the case, including this week's Political Prisoner of the Week, Wilmer Ledea Pérez. Ledea was convicted of terrorism-related charges and sentenced to 30 years in prison. Hijacking isn't the type of activity that normally lands you a designation of a "political prisoner." But when you consider why the hijackers seized the ferry — to flee the Castro dictatorship for freedom in the United States — the kangaroo-court nature of the legal proceedings against Ledea and other hijackers; and the political message the regime was trying to send with the executions, and it is clear that the Baragua episode was much more than a criminal act.